Pre-Columbian Los Angeles imagined, about 1500 CE. 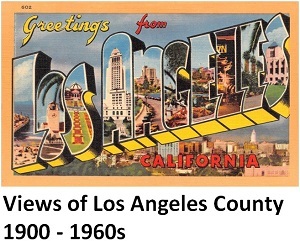 Los Angeles Almanac Image. Rock formations presently found on the present-day eastern slope of the San Gabriel Mountains begin forming beneath an ancient sea. The coastline is found considerably east of its present location in what is now Utah and Idaho. Toward the beginning of the Cenozoic Era, the Los Angeles Basin lies beneath the sea, receiving sediment from large rivers flowing out of the low-lying ancestral Nevadan mountains. Dinosaurs are extinct. The San Gabriel Mountains are beginning to form. Exhibit of prehistoric ocean over Los Angeles 15 million years ago at Natural History Museum of Los Angeles County. Los Angeles Almanac Photo. What will become the Los Angeles area continues to lie beneath a deep subtropical sea. Before the Pacific tectonic plate upon which it lies begins shifting northward, the future Los Angeles area is located about 100-150 miles southeast of where it is today. Later in this period, coastal California begins to emerge, with the local shoreline running along the San Gabriel, Santa Monica and Santa Ana Mountains and the Covina Hills. These ancient hills, ripe with volcanic activity, rise to an elevation of no more than 1,000 feet. Dry land around the submerged Los Angeles basin becomes subtropical, receiving about 30-40 inches of rainfall a year. It is covered with scrub forest and inhabited by ancient horses, rhinoceros and camels. What the Los Angeles area coastline may have resembled about 3-4 million years ago. Photo by Dom Carver, via Pixabay.com. Los Angeles area hills are forced upwards in height to become mountain ranges. The sea level continues to drop. Large mountain ranges now are present and the Los Angeles basin, forming from accumulating sediment deposits, is slowly rising from the sea, eventually bringing the shoreline, about 100,000 years ago, to about where it exists today. The climate is cooler and moister than present, similar to that of the present-day Monterey Peninsula, with glacier activity along the peaks of the San Gabriel and Santa Ana Mountains and Redwoods growing in the Santa Monica Mountains. Recreated Sabre-Tooth Cat image displayed at La Brea Tar Pits & Museum. Los Angeles Almanac Photo. The Los Angeles basin is a large grassy, brush-covered and marshy plain, roamed by saber-tooth cats (once referred to as tigers to enhance the image of their ferocity), Harlan's Ground Sloth, Dire Wolves, Western Horses, Ancient Bison, Yesterday's Camel, Short-Faced Bears (Artodus Simus), Columbian Mammoths and American Mastodons. Beginning about 35,000 years ago, a number of these animals are finding themselves trapped in the tar fields of what will be known as the La Brea Tar Pits. At about 12,000 years ago, the climate begins to warm considerably. Animals named in the previous period, along with many other concurrent species, are now extinct in Southern California. The Los Angeles basin is covered in grassy plains with scattered strands of junipers and cypress trees, streams, marshes, small lakes and ponds. The climate begins to cool again. Later, humans begin arrive to settle in coastal areas of the Los Angeles area, particularly the Ballona wetlands. Prehistoric La Brea Woman imagined in display at La Brea Tar Pits & Museum. Los Angeles Almanac Photo. For reasons fair or foul, the body of a young women who would later become known as La Brea Woman, is left in La Brea Tar Pits area of Los Angeles. Her remains are found 9,000 years later in 1914. This period is perhaps the same period in which Los Angeles Man lives. Chumash ancestors engage in sophisticated basketry and make use of asphaltum (tar) for water-proofing. There is increased reliance on hunting and the more sophisticated technological developments such as the throwing stick, knives, drills, and fish hooks. Burials include more artifacts. Humans appear to have abandoned the Los Angeles area. Modern archeologists speculate that dramatically dropping sea levels turn the marshy, marine life-rich wetlands, important to local human habitation, into “a brackish water lagoon." Long absent, human settlement reappears in the Los Angeles area around the the Ballona wetlands. These ancestors of the Chumash engage in warfare and trade and form alliances. There is increased division of labor and craftsmanship. Funerary practices are more elaborate. Relying heavily on marine life for food, they practice little to no agriculture. The first people later to be known as the Gabrielino (or Kizh) arrive in what will become Los Angeles County from the Mojave area, displacing many of the Chumash residents. Replica of a Gabrielino (Kizh) structure at Heritage Park in Santa Fe Springs. Los Angeles Almanac Photo. Some Chumash people are still present in the Los Angeles area in what will become Malibu, engaging in sports competitions and development of musical instruments. Trade in the region is widespread, including the use of shell beads for money. About 25 Gabrielino villages exist in what will become Los Angeles County. The population is about 300 to 500 people. Image of Juan Rodríguez Cabrillo by an unknown artist. Courtesy of Wikimedia Commons. Leading an expedition of three ships, explorer Juan Rodríguez Cabrillo arrives at Santa Catalina Island (October 7), the first Europeans to visit the future Los Angeles area. After coming ashore, the Spanish landing party encounters a large group of armed native people, but the meeting ends on friendly terms. Cabrillo names present-day Santa Catalina Island San Salvador after his flagship and nearby present-day San Clemente Island Victoria after another of the three ships. The following day, Cabrillo sails into San Pedro Bay then follows the coastline into Santa Monica Bay. Seeing distance Indian campfires from Santa Monica Bay, he names the bay Baya de los Fumos (Bay of Smoke). The first Spanish land expedition of present-day California, led out of San Diego by Captain Gaspar de Portolá, arrives in present-day Los Angeles County (July 30), travelling north through the La Habra pass over the Puente Hills. The party, consisting of 64 persons, turns west through the present-day San Gabriel Valley, and encounters the muddy San Jose Creek (a tributary of the San Gabriel River) over which they must construct a "a bridge of poles" (La Puente) in order to cross. August 2, the party stops to camp in the future Los Angeles where Father Juan Crespi, a chaplain in the expedition, first records a name for the nearby river, El Río de Nuestra Señora La Reina de Los Ángeles de Porciúncula (The River of Our Lady the Queen of the Angels of Porciúncula). There, native people from the nearby village of Yang-Na (located near the present-day Civic Center) greet the party. The expedition also reports a series of earthquakes occuring while in the area. August 3, the expedition moves roughly along the route of the future Wilshire Boulevard and camps near the head of Ballona Creek. August 4, the expedition marches into the present-day Pacific Palisades area. August 5, the expedition determines the route north along the coast to be too difficult to transverse. They turn back inland to head northwest, along the route of the future Sepulveda Boulevard, marching through the pass into the present-day San Fernando Valley. There they camp in present-day Encino where they again encounter another friendly native village. August 7, after a day's stayover for rest, the expedition continues their march north, ending to camp near the future site of the Mission San Fernando. August 8, the expedition continues north, along the route of the future Interstate 5. They camp at the Santa Clara River in the Santa Clarita Valley near the site of the future Six Flags Magic Mountain amusement park. There they again interact with a nearby friendly native village. August 10, after another stayover day for rest, the expedition leaves present-day Los Angeles County into present-day Ventura County. Image of Captain Gaspar de Portolá. Courtesy Wikimedia Commons. Fathers Pedro Cambon and Angel Somera establish the Mission San Gabriel Arcangel (Saint Gabriel the Archangel) at its first location in modern-day Montebello (September 8). Original site of the Mission San Gabriel in Montebello at San Gabriel Boulevard and Lincoln Avenue. Los Angeles Almanac Photo. Padres are forced to move the Mission San Gabriel Arcangel to its present location in modern-day San Gabriel due to flooding at the original site. Mission San Gabriel. Los Angeles Almanac Photo. Juan Bautista de Anza stops at the Mission San Gabriel Arcangel leading a band of the first 30 Spanish families to colonize California. They are enroute to establish a settlement in the San Francisco area. Governor Felipe de Neve issues instructions for the establishment of a new pueblo (town) with the proposed name El Pueblo de la Reina de Los Angeles Sobre el Rio de la Porciuncula (August 26). It becomes known as El Pueblo (The Town). The first Indians are baptized at the Mission San Gabriel seven years after the establishment of the mission. Governor Felipe de Neve visits the future site of the new pueblo to clear the land and mark it off. Forty-four men, women, and children begin life at the new pueblo, El Pueblo de Nuestra Señora la Reina de los Angeles de Porciuncula (The Town of Our Lady the Queen of the Angels of the Porciuncula River)(September 4). Only two of the original adult settlers are white Spaniards. The other settlers are of Indian, Mestizo, African, and Mulatto descent. Twenty-two are children. Founders of Los Angeles diorama at the Natural History Museum of Los Angeles County "Becoming Los Angeles" exhibit. Los Angeles Almanac Photo. Father Junipero Serra arrives in El Pueblo to condemn the moral condition of its residents. The first three land grants in the Los Angeles area are given to three soldiers, Juan José Dominguez, Manuel Nieto, and José Maria Verdugo. These are Los Angeles’ first ranchos. Handdrawn copy of earliest map of Los Angeles drawn by José Arguello, 1786. Shows residence and farm plot for each settler. Courtesy Bancroft Library, UC Berkeley. An attempt by about two dozen local native Indians to rebel and, perhaps, kill Spanish soldiers and priests at the Mission San Gabriel is foiled after the Spaniards are informed of the plot. The rebels are surprised and most are subdued and captured. Two are charged with planning and leading the rebellion, a young medicine woman named Toypurina from a nearby Indian village and a prominent early convert at the mission named Nicolás José. Two years later, both were found guilt in Spanish court of guilty of leading a rebellion against Spanish and Christian authority. They were banished to distant missions, Toypurina to San Carlos Borromeo (Mission Carmel in modern-day Carmel-By-The-Sea) and Nicolás José to the presidio at San Francisco de Asis (Mission Dolores in modern-day San Francisco). José Vanegas, one of the original settlers and an Indian, is appointed Alcalde (mayor) of El Pueblo. A census at the time reported 131 people in El Pueblo de los Angeles and 1,175 in the entire surrounding province. The Mission San Fernando Rey de España (Saint Ferdinand, King of Spain) is founded by Father Lasuén (September 8). Portrayal of early California missionary on display at Mission San Fernando. Los Angeles Almanac Photo.